The Bitcoin: A Fake, a Fad, or the Currency of the Future? The word “cryptocurrency” seems to make people a bit nervous, but that’s the new category that Bitcoin falls into. Did you just shudder? Don’t. It’s true that there’s a certain dark overtone to a word that connects “crypt” with “currency,” but remember the “crypto” root comes from the Greek word for “hidden.” Bitcoin originates in mathematical puzzles, after all. Did we just lose you? Let’s review some Bitcoin basics. What should you know about Bitcoin? The first specifications and proof of concept for Bitcoin came in 2009, when Satoshi Nakamoto proposed the idea on a cryptography mailing list. Nakamoto’s identity outside of this project has remained unknown. His original Bitcoin codebase has since been built upon and further organized by a community of developers and volunteers. Bitcoin is the first decentralized peer-to-peer payment network. There is no FDIC backing or link between Bitcoin and any banking institution. Bitcoins arose in the midst of the Great Recession when the integrity of banks and overwhelming government regulations were in question. Bitcoin is accepted internationally. Businesses that accept Bitcoin for payment range from Amazon to Target to Home Depot to Morton’s Steakhouse to Midlothian Web Solutions and so many more. They are now traded on Bitcoin exchanges, which in many ways are similar to any other stock exchange. The daily price of a Bitcoin fluctuates just like that of any stock. Yes, there are risks to purchasing Bitcoin, just like there are risks in purchasing any other stock. There are no physical bitcoins. 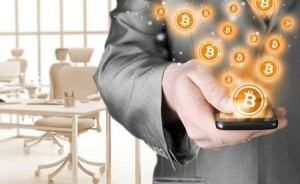 One can own Bitcoin in a digital wallet that exists either on a physical machine or in the cloud. If this makes you nervous, think about how your present banking already operates. Account specifics are often stored in a similar way, right? Without banks acting as a middleman, Bitcoins can be traded as easily and as privately as cash. No sensitive information (like credit card numbers, names, addresses, etc.) needs to be exchanged when paying in Bitcoin; therefore, there is no need for merchants to have PCI compliance. Rather than a government deciding when and how to print money, Bitcoin are created via Bitcoin mining, which involves utilizing special software to solve math problems, which will result in a certain number of bitcoins issued. Bitcoin is free software, and any developer can view or contribute to its code. The fact that anyone can see every detail of its inner-workings is an argument for why the currency will remain honest. No one owns or controls Bitcoin. The currency is powered by its users. This open-source philosophy is really a lot like that of the Internet itself. So in short, is Bitcoin here to stay? We have no idea. What we do know is that Bitcoin is far more than digital Monopoly money. Its core seeks to satisfy what some argue is a flaw in contemporary banking as we know it. Is it the right answer to the right question? It’s hard to say. As for us, we’re staying tuned. Cryptocurrency or not, Bitcoin has a lot of believers and a very active development community. There are certainly a lot of possibilities for its future.